Experience one each of Branson's most popular shows and attractions with the Haygoods and Titanic Getaway Package starting at just $319 for two adults. With this fantastic package you'll receive a 2 night stay in a double queen room, that includes complimentary breakfast, at the wonderful Grand Plaza Hotel. 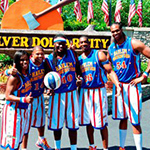 You'll enjoy one of the most energetic atmospheres in Branson as you spend time watching the Haygood family perform! Then drift back to a time when things were simpler as you take in all the amazing and one of a kind artifacts at the Titanic Museum Attraction. View package here. 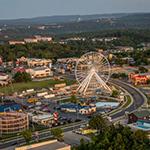 "It's truly an amazing thing to see the gigantic Branson Ferris Wheel towering elegantly over the Branson Strip" said Preston Garrison, the Operations Manager for the Branson Tourism Center, one of Branson's largest providers of tourism services and information. Garrison was referring to the transition and metamorphosis of the famed Chicago Navy Pier Ferris Wheel from Chicago, where it was to be replaced by a bigger one, to Branson, thanks to the efforts of the Track Family Fun Parks. "A scenic sightseeing cruise on beautiful Lake Taneycomo, aboard Main Street Lake Cruises' 84-foot-long riverboat replica Lake Queen, is truly a one of a kind experience that will become one of your family's most treasured Branson memories," said Allison Jussel, the administrative assistant for Main Street Lakes Cruises. 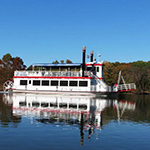 "A cruise aboard the Lake Queen is an experience reminiscent of the boats and the White River that played such an important part in Branson's early history and is one of Branson's most magnificent shows produced by Mother Nature herself," she added... Read entire article here. Actually, how terrific is the amazing Haygoods show? Based on over 30 years of seeing Branson shows and having seen the show on May 6, I can testify to the fact that it's, "Really terrific!" 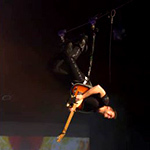 The Haygoods show is a WOW, WOW, and WOW, on a Three WOW Index with three WOWs being as high as you can get! 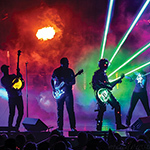 From the "Get go," its two hours of the most unique, innovative, talented, energetic, personable, and exciting entertainment you will ever experience on a Branson stage. Read entire article here.